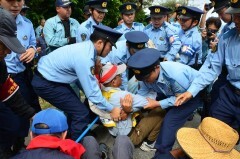 At around 10:10am on September 28, in front of the Oyama gate of U.S. Marine Corps Futenma Air Station in Ginowan, police forcefully remove sit-in protesters seeking the withdrawal of the Osprey aircraft. From 9:00am on September 28, in front of the Oyama gate of the U.S. Marine Corps Air Station Futenma, about 100 people from civil groups such as the Okinawa Peace Movement Center and labor unions held a rally to protest against the deployment of MV-22 Osprey vertical take-off and landing transport aircraft. The people sat in front of the gate and halted all vehicle traffic in and out of the base for a short time. They got into a shoving match with the police, and at about 11:20am a woman in her 60s was taken away in an ambulance in a confused state. The extent of her injury is unknown at this time. As of noon, protesters were still sitting in front of the gate. Around 10:30am, Marines closed the Oyama gate of the base. The gates of the Futenma Air Station were blocked by the protest in two places, including the Nodake gate, in the afternoon of September 27. The Marines secured their inbound and outbound traffic through the gate at Samashita. From 7:00am on September 28, in front of the Nodake gate, the executive committee that organized the Okinawan People Mass Rally on September 9 in Ginowan, held a protest rally. About 300 people, including members of the Diet, prefectural government assembly, and mayors of cities, towns, villages, as well as citizens participated in the rally, demanding that the governments of Japan and the United States abandon the Osprey deployment.